For Bob Edgar, the Halifax Explosion was an everyday experience to talk about. His family moved to the city’s north end in 1946 and there were reminders everywhere. 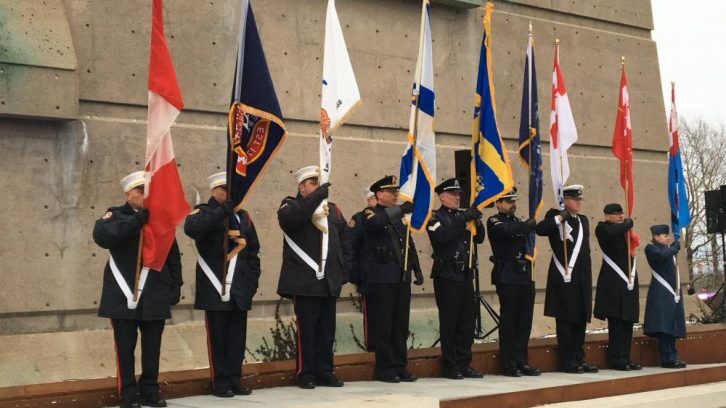 Edgar attended Thursday’s ceremony to mark the 101st anniversary of the explosion to remember what other people did for Halifax. On Dec. 6, 1917, two ships, the SS Imo and the SS Mont Blanc collided in The Narrows of the Halifax Harbour. The Mont Blanc, which was carrying thousands of explosives blew up near Pier 6 in the Richmond area. The explosion devastated Halifax, resulting in roughly 2,000 deaths, 9,000 injuries and left approximately 25,000 people homeless. Halifax received help from multiple organizations and thousands of people across the country and internationally. At the ceremony at Fort Needham, Mayor Mike Savage urged attendees to remember the event’s heroes. He reminded them of Vincent Coleman, who sent a transmission to an incoming train about the explosion, losing his own life in the process. “Let the heroism of Vincent Coleman remind us that we are all ordinary people capable of extraordinary things,” said Savage in his speech. Wayne Rhyno felt it was important to attend the ceremony to honour his mother, who was 18 months old during the explosion. He recalls a story that was passed down to him by his older sister. His mother had just been taken out of her crib minutes before 9 a.m. by his grandmother. After the explosion, the crib was filled with shards of glass from a window. “I thank God that my mother survived so I could be here,” said Rhyno, one of nine children. Girl Guides leaders Diane Moulton and Beulah Chisholm said they have been bringing Girl Guides and Brownies from the Windsor Park district to the ceremony for about 10 years. The Windsor Park district covers the north end area where the explosion made the most impact. Chisholm said they also provide history lessons about the explosion as part of their history of Canada program. “It’s important for the girls to remember the history and the significance of the day,” said Chisholm.